Attainder of Oliver Cromwell, &c.
ORDERED, That the Committee, to whom the Bill for confirming an Estate purchased of Sir John Clerke, by Charles Doe, be revived, and sit this Afternoon at Two of the Clock, in the Court of Wards; and that the Petition of Sir John Clerke Knight and Baronet, and Dame Philadelphia his Wife, be referred to the said Committee: And that Mr. Ayres, Sir John Northcott, and Lord Aunger, be added to that Committee. A Bill, ingrossed, for enabling Sir William Wrey to sell Lands for Payment of his Debts, and raising Portions for his younger Children, was this Day read the Third time; and, upon the Question, passed. Resolved, That the Title thereof be, An Act for enabling Sir Wm. Wrey to sell Lands for Payment of his Debts, and raising Portions for his younger Children. A Bill, ingrossed, for raising Portions, and making Provision for Maintenance, for the younger Children of Sir Edward Gostwicke Baronet, was this Day read the Third time; and, upon the Question, passed. Resolved, That the Title thereof be, An Act for raising, &c.
Ordered, That these Bills be carried to the Lords: And Sir Anth. Irby is to carry them to the Lords. Resolved, That every Day, precisely at Nine of the Clock, the House be desired to enter upon one of the publick Bills following; which are, by this Committee judged to be the most important to be dispatched; viz. 1. Bill for taking away the Court of Wards, and Purveyance; and settling the Moiety of the Excise on his Majesty and his Heirs. 2. Bill for the other Moiety of the Excise, to be settled on his Majesty for Life. 3. Bill for the Militia. 4. The Bill for the Six Months Assessments. 5. The Bills of Attainder; and Pains and Penalties. 6. The Bill for Review of the Poll Bill. 7. The Bill for the Post Office. 8. The Bill for receiving the Arrears of the Excise, settling the Foreign and Inland Excise, and securing publick Debts. 9. The Bill concerning Tobacco. 10. The Bill for Wine Licences. 11. The Bill for the Fens. Bills of a mixt Nature. 12. The Bill for Tanning of Leather. 13. A Bill for the Fishery. 14. A Bill for better gathering of the Customs. Resolved, That private Bills be proceeded in daily, till Nine of the Clock; and then, if not dispatched, the Debates to be adjourned till next Day. A List of private Bills. The Bill for Covent Garden Parish. Bill to enable Mr. Milward to sell Lands. Bill to enable Mr. Geo. Faunt to sell Lands. Bill to enable Mr. Mickletwaite to sell Lands. Private Bills to be reported. A Bill for settling Preston Rectory on Emanuel College. Sir John Clerk's and Charles Doe's Bill. Bill for the Earl of Cleveland. He also reports a List of other Bills, sent from the Lords; viz. For restoring the Earl of Derbie's Estate. For restoring the Earl of Roscomen's Estate in Ireland. For prohibiting the Planting of Tobacco in England. For Naturalizing of Francis Astley, Son of Lord Astley. For the Lord Lexington and Sir Tho. Williamson, to vy Two thousand Six hundred and Eighty Pounds, out of Colonel Hutchinson's Estate. Resolved, That every Day precisely at Nine of the Clock, the House do enter upon one of the said publick Bills, with the Addition of the Bill for publick Sales, in such Order as this House shall judge most important for their Dispatch. Resolved, That private Bills and Businesses be proceeded in daily, till Nine of the Clock, in such Order as the House shall think fit; and that the Debate of such of them as shall not be dispatched at the Hour of Nine, shall be adjourned till the next Day. 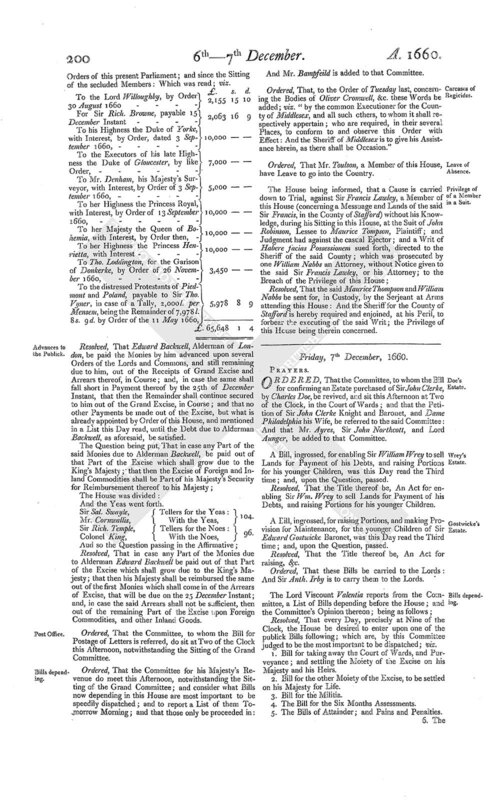 Bills sent from the Commons before the Recess; and depending before the Lords. Bill for confirming of Leases from Colleges and Hospitals. Bill for confirming of Marriages. Bill for uniting Donkerke and Jamacha to the imperial Crown of this Realm. Bill for the getting in of the Money collected for the Protestants of Piedmont, owing by Mr. Noell, &c.
Bill for indemnifying Officers of Courts of Justice. Bill for the County and City of Durham to send Members to Parliament. 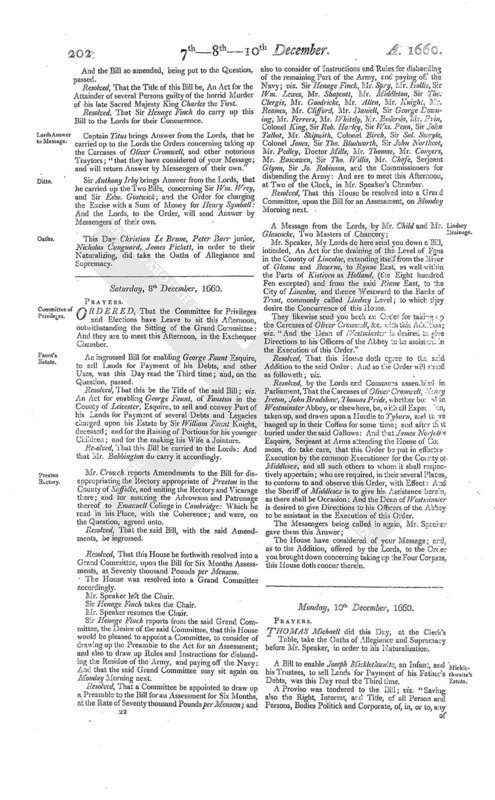 Bill for confirming Magna Charta; and other fundamental Laws. Proclamation against Priests and Jesuits. Concerning the Minister of Royston. Bill for the levying of the Arrears of the Twelve Months, and Six Months, Assessments. Bill for the better Observation of the Lord's Day. Bill against profane Swearing and Cursing. Bill against exporting of Wool, Woolfells, Fullers Earth. 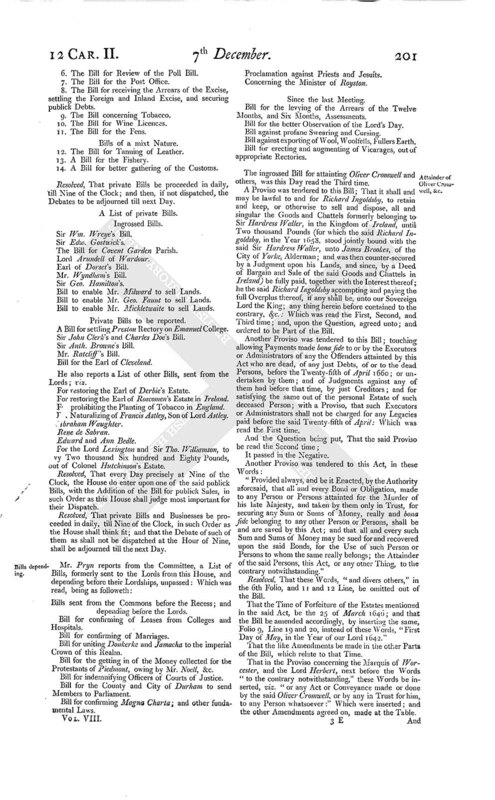 Bill for erecting and augmenting of Vicarages, out of appropriate Rectories. The ingrossed Bill for attainting Oliver Cromwell and others, was this Day read the Third time. A Proviso was tendered to this Bill; That it shall and may be lawful to and for Richard Ingoldsby, to retain and keep, or otherwise to sell and dispose, all and singular the Goods and Chattels formerly belonging to Sir Hardress Waller, in the Kingdom of Ireland, until Two thousand Pounds (for which the said Richard Ingoldsby, in the Year 1658, stood jointly bound with the said Sir Hardress Waller, unto James Brookes, of the City of Yorke, Alderman; and was then counter-secured by a Judgment upon his Lands, and since, by a Deed of Bargain and Sale of the said Goods and Chattels in Ireland) be fully paid, together with the Interest thereof; he the said Richard Ingoldsby accompting and paying the full Overplus thereof, if any shall be, unto our Sovereign Lord the King; any thing herein before contained to the contrary, &c.: Which was read the First, Second, and Third time; and, upon the Question, agreed unto; and ordered to be Part of the Bill. Another Proviso was tendered to this Bill; touching allowing Payments made bona fide to or by the Executors or Administrators of any the Offenders attainted by this Act who are dead, of any just Debts, of or to the dead Persons, before the Twenty-fifth of April 1660; or undertaken by them; and of Judgments against any of them had before that time, by just Creditors; and for satisfying the same out of the personal Estate of such deceased Person; with a Proviso, that such Executors or Administrators shall not be charged for any Legacies paid before the said Twenty-fifth of April: Which was read the First time. "Provided always, and be it Enacted, by the Authority aforesaid, that all and every Bond or Obligation, made to any Person or Persons attainted for the Murder of his late Majesty, and taken by them only in Trust, for securing any Sum or Sums of Money, really and bona fide belonging to any other Person or Persons, shall be and are saved by this Act; and that all and every such Sum and Sums of Money may be sued for and recovered upon the said Bonds, for the Use of such Person or Persons to whom the same really belongs; the Attainder of the said Persons, this Act, or any other Thing, to the contrary notwithstanding." Resolved, That these Words, "and divers others," in the 6th Folio, and 11 and 12 Line, be omitted out of the Bill. That the Time of Forfeiture of the Estates mentioned in the said Act, be the 25 of March 1646; and that the Bill be amended accordingly, by inserting the same, Folio 9, Line 19 and 20, instead of these Words, "First Day of May, in the Year of our Lord 1642." That the like Amendments be made in the other Parts of the Bill, which relate to that Time. That in the Proviso concerning the Marquis of Worcester, and the Lord Herbert, next before the Words "to the contrary notwithstanding," these Words be inserted, viz. "or any Act or Conveyance made or done by the said Oliver Cromwell, or by any in Trust for him, to any Person whatsoever:" Which were inserted; and the other Amendments agreed on, made at the Table. And the Bill so amended, being put to the Question, passed. Resolved, That the Title of this Bill be, An Act for the Attainder of several Persons guilty of the horrid Murder of his late Sacred Majesty King Charles the First. Resolved, That Sir Henage Finch do carry up this Bill to the Lords for their Concurrence. Captain Titus brings Answer from the Lords, that he carried up to the Lords the Orders concerning taking up the Carcases of Oliver Cromwell, and other notorious Traytors; "that they have considered of your Message; and will return Answer by Messengers of their own." Sir Anthony Irby brings Answer from the Lords, that he carried up the Two Bills, concerning Sir Wm. Wrey, and Sir Edw. Gostwick; and the Order for charging the Excise with a Sum of Money for Henry Symball: And the Lords, to the Order, will send Answer by Messengers of their own. This Day Christian Le Brune, Peter Barr junior, Nicholas Cungnard, James Pickett, in order to their Naturalizing, did take the Oaths of Allegiance and Supremacy.